One piece corrugated construction that can be scored to allow for multiple depths. 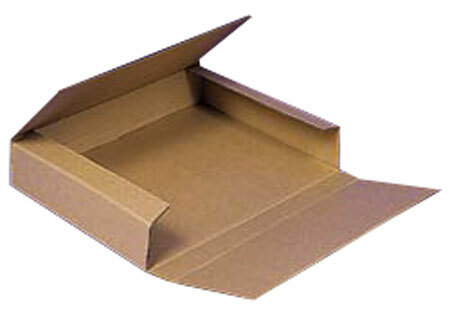 Ideal for mailing and shipping books, magazines, computer reports and other items shipped as single units. Constructed using one piece of board cut to provide a flat bottom, with flaps forming the sides and ends, and extensions of the side flaps meeting to form the top. Available in Kraft, oyster white or bleached white. Two rectangular scored pieces providing a double unbroken layer for the bottom and a double layer for the top. The flaps of one piece for the sides of the folder while the flaps of the second piec form the ends.